life has ebb and flow. Every year, Binghamton University hosts 3 All-County festivals in our area. I just attended Festival 2 this weekend with 7 of my best and brightest 5th graders. While they sang for many hours at a time, I spent most of my time watching rehearsal and schmoozing with other music teachers in the area. My buddy Al was also there with some of his best and brightest, except he's a BAND director, so we had to sneak out of our respective rehearsals to engage in our normal tomfoolery. So - while things got boring and we both trusted that our kids would be adequately busy to avoid misbehavior, we ran around the Anderson Center for the Performing Arts (awesome facility! ), taking funny pictures. I thought about putting together a powerpoint show called "what teachers REALLY do at All-County" but I decided against it. These are the photographic results. Photo 1 (above): Help! 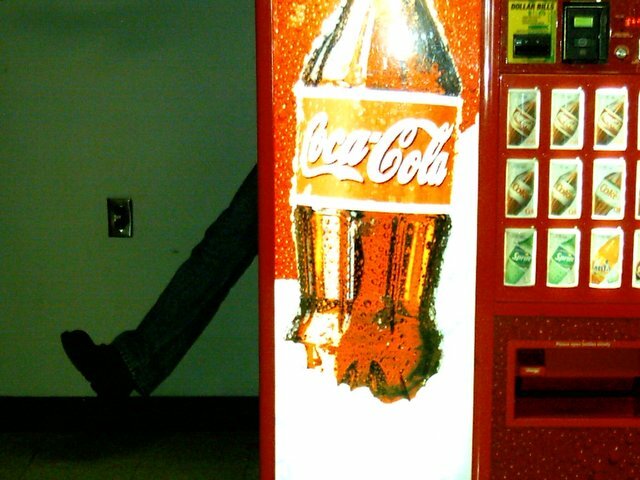 I'm being eaten by a giant Coke machine! Photo 2: There was this black granite plaque of the namesake of one of the theatres on the wall, and the guy looks like a grumpy old curmudgeon (but for all I know, he was a genius or is still alive and caught me doing this). So I saw it and said, "ooh, he's HOT!" and proceeded to pretend to worship the plaque. Al and I love to mug for cameras, and this was one of those instances. He calls me "Em-wee" and so he said, "awww, Em-wee!" and I said "aw, Al!" 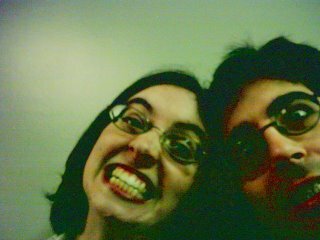 and then we took the picture that showcases my very yellow-looking teeth. And, of course, in the lobby of the concert hall, there are big potted TREES! So I climbed into one, and we thought it looked like a great jungle shot. It's one of my favorites of the day. I have this one student who got an ipod Nano for Christmas, and she LOVES it. 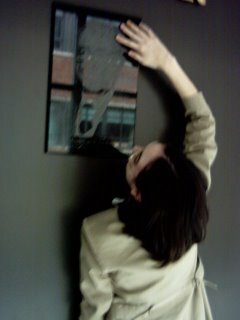 She also carries it EVERYWHERE she goes. I was appointed guardian of her iPod during the rehearsals - a task she took VERY seriously. So, of course, I had to do the swallow-the-ipod trick just to freak her out. 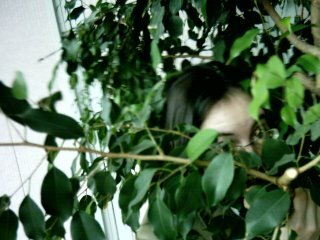 We showed the picture to her with the digicam, but she knew it was a trick. Darn. Love you, lady. Thanks for starting off my day with a smile. Nice pics. Sounds like a wickedly fun time. Ain't kids great? J ' ai toujours pensé que le coke était dangereux . Pas étonnant que tu aies failli être mangée par cette satanée machine . J ' ai aimé voir ces photos de toi joyeuse et souriante ( avec Al ) et même espiègle ( dans l ' arbre ) . I'm a newly-established official "adult" who is rushing headlong into the Real World of teaching and being on her own. I always have been and always will be trying to figure myself out completely. I am moody, volatile, passionate, and just plain interesting. I'm told I'm kinda smart too.